Rising groundwater can flood roads up to two miles from the ocean, new research from UNH has found. On New Hampshire’s Seacoast, rising seas could cause flooded roads in unexpected places: up to two miles inland, even as far as Pease Tradeport. That’s the finding from a team of UNH researchers who looked at the effect of rising groundwater caused by increasing ocean water levels. Flooding not only makes roads impassable in the short term, it can hasten roads’ failure; understanding how to identify roads vulnerable to flooding is essential for pavement engineers and others to plan for the effects of a changing climate. In the study, Knott and her colleagues identified sections of specific Seacoast roads that are the most vulnerable as groundwater levels continue to rise. They include the heavily traveled Route 286 in Seabrook and Gosling Road in Portsmouth. Without drastic improvements to these routes, at or below the pavement surface, motorists can expect segments of these roadways to deteriorate more quickly, require more maintenance and be closed for longer periods of time, they found. Groundwater levels are higher than sea levels, and that drives the groundwater discharge to the ocean. But as sea levels begin to rise, this forces groundwater to slowly move up to maintain the equilibrium, inching closer to the pavement base layers that need to stay dry to defend their strength. For the study, the research team examined the cross-section data for the most endangered sections of five Seacoast roads — the Spaulding Turnpike, Gosling Road, Route 286, Route 101 and Middle Street. Highways are usually built more stout, with thicker cross-sections of materials to withstand heavier traffic, while smaller town roads are sometimes little more than layers of pavement over shallow depths of crushed gravel. The thickness of the pavement base layers provides a buffer that protects the road as groundwater rises. The roads where groundwater is already close to the surface are the ones that will likely be affected first, although local geology, topography, soil type and drainage can also influence this. 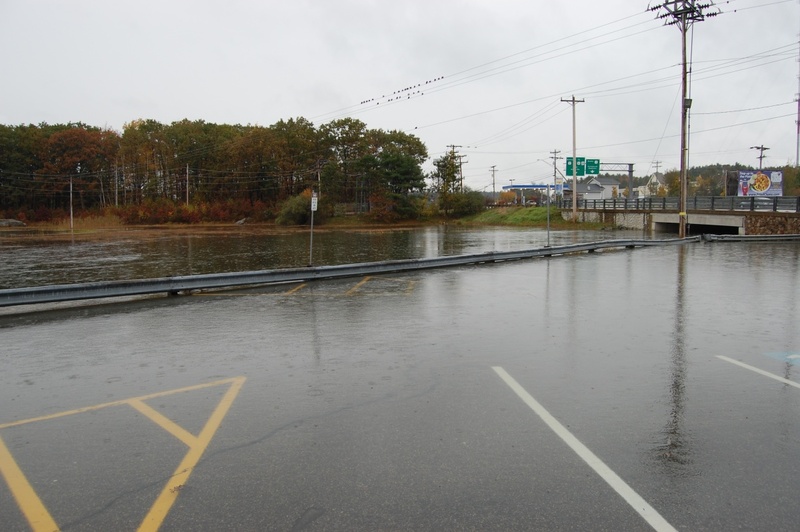 Researchers then compared the New Hampshire Department of Transportation road cross-section data with current and projected groundwater levels given various sea level rise scenarios ranging from one foot by 2030 to 6.6 feet by the year 2100. The results indicate that although Route 101 and the Spaulding Turnpike will probably not have many adverse issues due to rising groundwater until late in this century, both Route 286 — an emergency evacuation route — and Gosling Road are likely to be some of the first roads affected. In addition to Knott and Daniel, co-authors of the study are Mohamed Elshaer, a doctoral student in civil and environmental engineering at UNH; Jennifer Jacobs, UNH professor of civil and environmental engineering and co-director of the Center for Infrastructure Resilience to Climate, and Paul Kirshen of the University of Massachusetts, Boston. This research was supported by New Hampshire Sea Grant, New Hampshire Seacoast Transportation Climate Working Group, New Hampshire Department of Transportation, New Hampshire Department of Environmental Services, Infrastructure and Climate Network and the UNH Center for Infrastructure Resilience to Climate.